In between crucifixion and resurrection, a moment to consider the Sacred Harp song “Easter Anthem” (236 in the 1991 Denson revision of the Sacred Harp), tune by William Billings (1787). I posted the music on 4/20/14, along with a link to a video of the song at the Kalamazoo MI all-day singing on 7/20/09. Now the SH text, and its source, in an intense, visionary poem by Young. The Lord is ris’n indeed! and becomes the first-fruits of them that slept. Hear it, O ye dead! He burst the bars of death. then I rose, then I rose, then I rose. passed the crystal ports of light. I used to think that the “crystal ports of light” was just some weird stuff from the Book of Revelation. But no, it’s right out of Young’s imagination, from his poem Night-Thoughts. 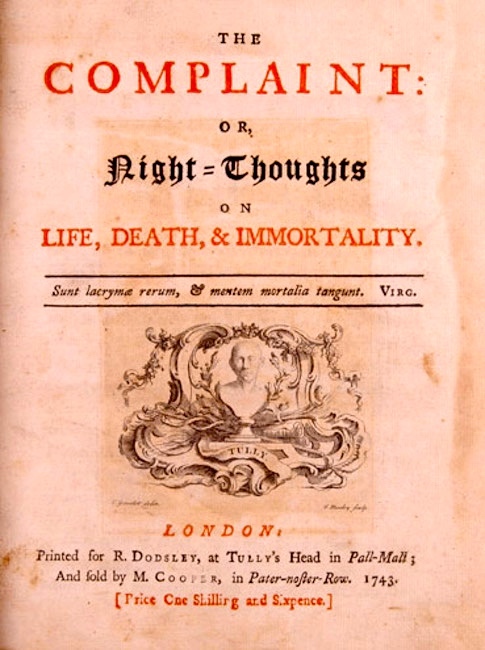 The Complaint: or, Night-Thoughts on Life, Death, & Immortality, better known simply as Night-Thoughts, is a long poem by Edward Young published in nine parts (or “nights”) between 1742 and 1745. The poem is written in blank verse. It describes the poet’s musings on death over a series of nine “nights” in which he ponders the loss of his wife and friends, and laments human frailties. The best-known line in the poem (at the end of “Night I”) is the adage “procrastination is the thief of time”, which is part of a passage in which the poet discusses how quickly life and opportunities can slip away. Night-Thoughts had a very high reputation for many years after its publication, but is now best known for a major series of illustrations by William Blake in 1797. 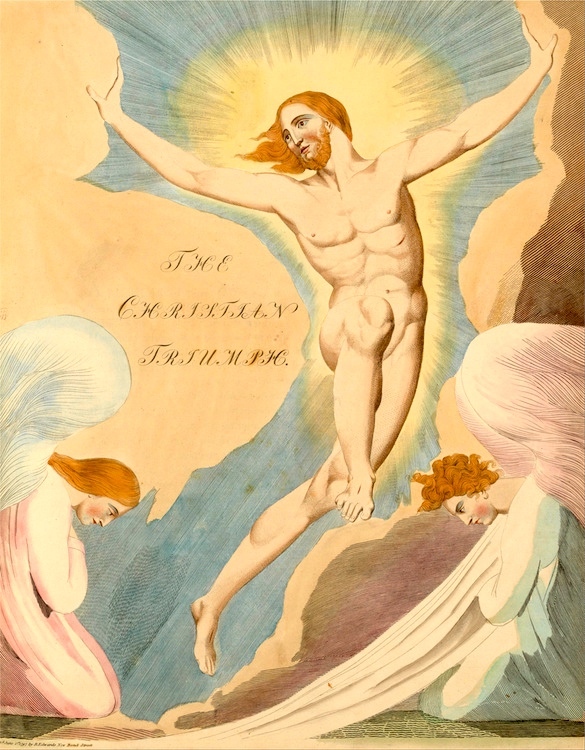 A lesser-known set of illustrations was created by Thomas Stothard in 1799. The nine nights are each a poem of their own. They are: “Life, Death, and Immortality” (dedicated to Arthur Onslow); “Time, Death, Friendship” (dedicated to Spencer Compton); “Narcissa” (dedicated to Margaret Bentinck); “The Christian Triumph” (dedicated to Philip Yorke); “The Relapse” (dedicated to George Lee); “The Infidel Reclaim’d” (in two parts, “Glories and Riches” and “The Nature, Proof, and Importance of Immortality”; dedicated to Henry Pelham); “Virtue’s Apology; or, The Man of the World Answered” (with no dedication); and “The Consolation” (dedicated to Thomas Pelham-Holles). What heart of stone but glows at thoughts like these? The ravenous foe, that gorged all human race! Powers most illumined, wilder’d in the theme. The theme, the joy, how then shall man sustain? O the burst gates! crush’d sting! demolish’d throne! Last gasp of vanquish’d Death! Shout earth and heaven! Took wing, and mounted with him from the tomb! Hail, Heaven! all lavish of strange gifts to man! The poem rolls on, loosely organized, one idea leading to another by association, with bursts of vivid imagery and quotations from the bible (Psalm 24:7 “Lift up your heads…”, Psalm 24:8 “Who is this King of glory?”). This entry was posted on March 31, 2018 at 9:52 am and is filed under Art, Holidays, Music, Poetry. You can follow any responses to this entry through the RSS 2.0 feed. You can leave a response, or trackback from your own site.